Cardio-K is a food supplement with approved claims to help maintain normal LDL cholesterol concentration by EFSA (European Food Safety Authority). Clinical studies have shown the effects of red yeast rice preparations with a known 10mg Monacolin K content reduce both LDL concentrations and also total cholesterol levels. The European Food Safety Authority has recently approved Monacolin K (nature’s statin) as an ingredient that can help maintain normal LDL cholesterol levels. Monacolins are naturally occurring substances found in Red Yeast Rice, however, it is Monacolin K that is the active ingredient that works in a very similar way to some pharmaceutical grade statins, and the big difference being it is naturally present not chemically manufactured. Red Yeast Rice is made by fermenting a type of red yeast called Monascus Purpureus over rice. Several studies have shown good evidence that Monacolin K present in red yeast rice can significantly lower total and “bad” LDL cholesterol levels. Two clinical studies recently submitted to the European Food Safety Authority (EFSA) show taking 7.5mg of Monacolin K per day for 12 weeks can reduce LDL levels by up to 22% and taking 11.4mg per day for 8 weeks can reduce LDL by up to 26%. 83 subjects with hypercholesterolaemia were tested. 42 subjects in the treatment group receiving a daily dose of around 7.5mg of Monacolin K. 41 subjects in the placebo group received a rice powder. After 12 weeks the results of the treatment group show a reduction from base line of 22% of LDL cholesterol levels with only 3% reduction in the placebo group. 75 subjects with hypercholesterolaemia were tested. 38 subjects in the treatment group receiving a daily dose of around 11.4mg of Monacolin K. 37 subjects in the placebo group received a grounded rice. After 8 weeks the results of the treatment group show a reduction from base line of 26.3% of LDL cholesterol levels with only 1.4% reduction in the placebo group. Cardio-K, a natural food supplement, contains 334mg Red Yeast Rice Extract which provides a guaranteed 10mg of Monacolin K the recommended daily dose required to maintain healthy cholesterol levels. The product also contains 30mg Co Q 10 for additional support. It is acknowledged that the amount of Co-enzyme Q10 present in the body declines with age; it supports healthy circulation, the immune system and is a powerful antioxidant. Lifestyle plays a major role in the development of heart disease and stroke. An unhealthy diet can place you at risk and can cause high cholesterol levels. Cholesterol is a fatty substance found in the blood, it is mainly made by the liver from fatty foods and is vital for the body to function normally. However, having a high level of LDL cholesterol can cause a build-up to occur, if the artery supplying the heart muscle becomes completely blocked, the heart muscle becomes damaged causing a heart attack. If an artery to the brain is completely blocked, it can damage the brain causing a stroke. When diagnosed with high cholesterol the options are to change our diets and lifestyles and in many cases we are advised by our medical professionals to take a pharmaceutical grade statin. Many of us are sceptical when faced with this prospect due to the side effects these drugs can cause. 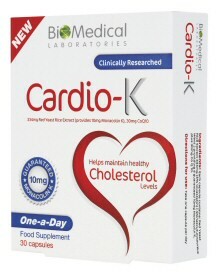 Cardio-K is the natural and easy way to keep your cholesterol levels in check, a one a day formulation to help maintain normal blood LDL-cholesterol levels.